I first marched in San Francisco’s Pride Parade in 2004. Pregnant with my oldest son, I walked alongside my (not yet legally wedded) spouse, with the marriage-equality contingent. When our group emerged from the staging area onto Market Street, we were met by a powerful wave of love and support from a crowd of spectators. Hundreds of thousands of people cheered, waved flags, and shouted their congratulations to those of us who had been married (illegally, it turned out) during San Francisco’s Winter of Love. “I want our baby to feel this energy,” I thought. No matter what happens during the other 364 days a year, I knew that our family would always find love and support at the Pride Parade. I didn’t know, however, that eventually I would be schlepping my two sons to the Pride Parade alone, a divorced Solo Mom. At first, I was intimidated by the prospect of flying solo at Pride, but I wasn’t about to let a change in family circumstance ruin one of my kids’ favorite days of the year. 1. Phone a friend. Sure, you could totally rock Pride on your own, just you and your kiddo(s), but isn’t everything more fun with friends? Grouping up with friends means both sharing the excitement and having a trusted point person to watch your child while you go pee. Double win! 2. If you want to participate in the parade. 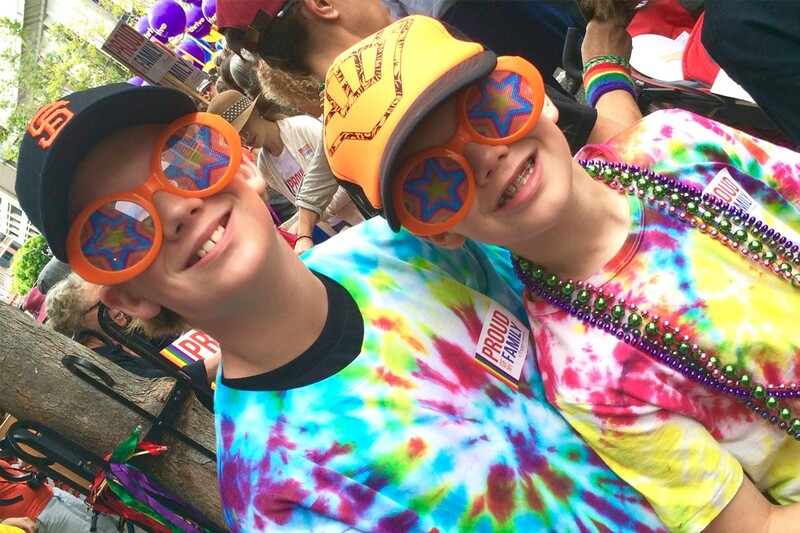 For my kids, the Pride Parade is about celebrating our family and receiving life-giving doses of love and support. For that reason, we have always marched in the parade. My children love working the crowd, handing out candy and beads and high-fiving bystanders. If you choose to participate in the parade, join a family-friendly contingent where your kid can connect with other kids and you can commiserate—I mean celebrate—with other parents. In San Francisco, we march with Our Family Coalition. What family-friendly organizations march in your hometown? Local chapters of PFLAG, the Gay, Lesbian & Straight Education Network, and LGBTQ-inclusive churches are likely to participate. 3. If you want to watch. Walking a long parade route while a couple hundred thousand spectators cheer at you? It’s not for everyone. Your child may prefer to camp out on the sidelines and watch the show. Fair warning, though: if you plan to watch, arrive long before the parade begins and grab a front-row seat; otherwise, your kids will end up staring at the backs of adults for the entirety of the parade. Also, depending on the tone and tenor of your town’s Pride Parade, certain parts of the “show” may raise a few questions in your children’s minds, such as “Why is that boy in underpants whipping that person wearing a leather mask?” Mostly, though, you’ll be in for some family-friendly fun. Necessities. Bring all the food you need, as well as refillable water bottles. You’ll skip both the lines and the exorbitant costs of festival food. parenting at Pride. So. What’s it going to be? A stroller to keep your kiddo contained? An Ergobaby to keep your child attached? One of those leashes that nonparents raise their eyebrows at but parents of wandering toddlers deeply appreciate? A pair of Razor scooters for you and your tween? 7. What we carry. Remember: what seems cute and clever at the beginning of a parade route might feel seriously inconvenient by the end. So, if you make signs to carry, make them light and small, and know where you’re going to put them when your arms get tired. If your child insists on wearing his fairy wings and Barbie high heels and waving his Day–Glo wizard wand, know you’ll be carrying all those accessories, and probably your child, by the end of the day. 8. Be safe out there. Of course the biggest concern of a Solo Mom—of any parent, really—is losing a kid in that roiling sea of people. You have only one pair of eyes, and sometimes they’re going to need to look away from your child to see what street you’re on or read the food truck menu. With a little preplanning, you can ease your fears (but not your vigilance because, come on, it’s a big crowd, and that’s a little person holding your hand). At the parade. Keep your cell phone charged and on. Write your cell-phone number on your child’s arm, in Sharpie (so it doesn’t sweat off). If your child is too young to understand instructions such as “If you cannot find me, look for an adult who has children with her and ask her to call me,” then try this: write your name and phone number, and “If I am lost, please call . . . ” on a sticker or length of masking tape. Stick it prominently on your child’s back (because a child who is too young to understand instructions is also young enough to pull an important sticker off the front of his or her shirt and drop it). Throughout the day. Every time you change locations—from the food truck line to the miraculously empty bench in the park—look around. Identify an “if we get separated” landmark. Point it out to your child and say, “If we get separated, meet me there,” then have the child repeat the instructions back to you. Always. Take all the above precautions, and then act like you haven’t taken any of them. Keep your eye on your child at all times. 9. Attitude is everything. If you attended Pride before you had kids, you’re about to find out that Pride with kids is very, very different. Like so many other things, this event is not about us anymore; it’s about them. Bring your solo mama sense of adventure (because, really, when you’re a Solo Mom, everything feels like an adventure) and your sense of humor (because large crowds plus small children equals haywire, and there’s no better response to haywire than laughter). Release any agenda you may have for yourself, and focus on your child’s experience. Have fun for as long as it feels fun for both of you and then, even if you’re only halfway through the parade route, call it a day. The ultimate goal: walk away happy and proud.